When the season began, new Whitworth football coach Rod Sandberg said that several of the more than 50 new players for the Pirates would have to step up and play right away for the team to have success. After the first three games, at least, consider that first hurdle crossed. 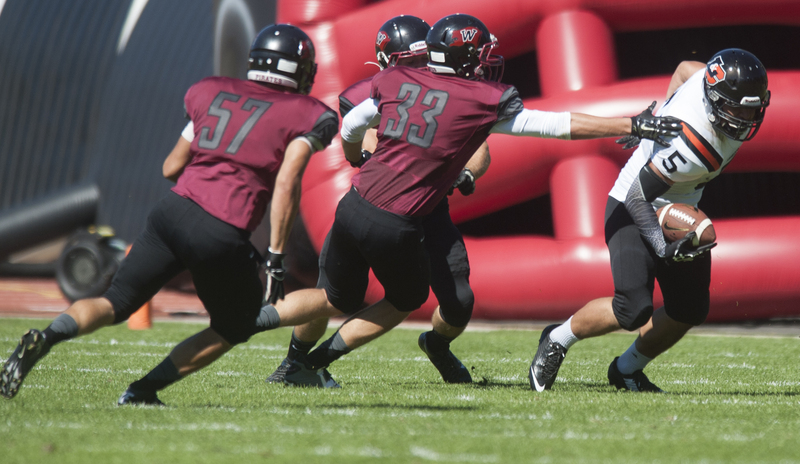 Whitworth (3-0, 1-0 NWC) has had huge contributions from several freshmen and new players. For instance, JT Phelan (East Valley) started the year as a backup linebacker but he currently leads the team with 20 tackles and is second on the team with 51/2 tackles for loss and he has 11/2 sacks. On offense, Nick Kiourkas (Shadle Park), led the team with 121 receiving yards in the 50-48 win last Saturday over La Verne and is averaging 12.8 yards per catch with two touchdowns. The team is also getting solid contributions from receiver Brett Moser (11 catches for 138 yards and a TD); and defensive backs Taylor Roelofs (eight tackles, one interception) and Jacob Sturtevant, who is fourth on the team with 18 tackles and three pass breakups. Another freshman who contributed early was Garrett McKay who was leading the team with 169 all-purpose yards before he went down with a serious knee injury. Kiourkas followed Stanfield from Shadle Park and came in knowing the offense. Phelan, a three-sport star at East Valley, actually came to Whitworth as a baseball recruit. But he had the itch to play football and found coaches more than willing to give him a shot to play both sports. Phelan played receiver and free safety at East Valley. “But I’m too slow for those positions here,” he said. Instead, the 6-foot-1, 200-pounder has moved to outside linebacker in Whitworth’s new 3-4 defensive scheme. Stanfield praised the play of Moser, of Moses Lake, whose 43-yard reception sparked the offense in a tight game against Whittier. Richbart also praised the contributions of Sturtevant, of Beaverton, Ore. He had nine tackles and a pass breakup against La Verne. Published: Sept. 25, 2014, 2:58 p.m.